Arturo Schomburg loved books. He loved them so much that he built a library. 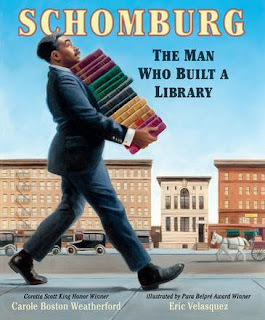 Schomburg: The Man Who Built a Library, shares Arturo Schomburg's story. Each double-page spread highlights a particular milestone or achievement in his journey. Arturo was born in Puerto Rico in 1874, and emigrated in 1891, settling in New York. He was politically active, and worked in the community as a means of self-development and community empowerment. Arturo taught Spanish, learned English, and worked as a messenger and clerk at a law firm. Arturo sought books to learn about his cultural heritage, and found there was no one book and no one library that held everything he wanted to know. He set about laying his hands on as many books, poems, letters, works of art and other items that captured the history he so desperately wanted to uncover. On his journey for knowledge, Arturo learned that much of the 'historical record was colourblind' and did not explain the many links to African heritage. Did you know Alexandre Dumas, author of The Three Muskateers was descended from slaves? Or that Beethoven's mother was described as being a Moor, from North Africa? Arturo's collection grew and grew. He worked in a mailroom during the day, but spent all his spare time advocating for recording and sharing black history. He spent many hours researching, writing and public speaking. Arturo himself became the 'guardian of his collection,' which he continued to add to. Schomburg: The Man Who Built a Library has been written by award-winning author and illustrator team Carole Boston Weatherford and Eric Velasquez. It's in a large format (over A4 in size) with vivid anecdotes and lush illustrations that capture the people and times. Arturo Schomburg's legacy lives on, not only in 'his' library, but also in the telling of his own story. A fitting tribute to the man whose thirst for knowledge and belief in the truth built a library.